Nearly two-thirds (63%) of cell phone owners now use their phone to go online, according to a new survey by the Pew Research Center’s Internet & American Life Project. We call them “cell internet users” and define them as anyone who uses their cell phone to access the internet or use email. 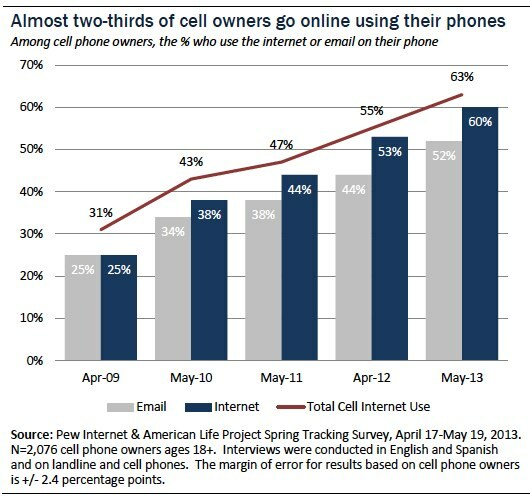 Because 91% of all Americans now own a cell phone, this means that 57% of all American adults are cell internet users. The proportion of cell owners who use their phone to go online has doubled since 2009. Additionally, one third of these cell internet users (34%) mostly use their phone to access the internet, as opposed to other devices like a desktop, laptop, or tablet computer. We call these individuals “cell-mostly internet users,” and they account for 21% of the total cell owner population. Young adults, non-whites, and those with relatively low income and education levels are particularly likely to be cell-mostly internet users. These are findings from a national telephone survey conducted April 17-May 19, 2013 among 2,252 adults ages 18 and over, including 1,127 interviews conducted on the respondent’s cell phone. Interviews were conducted in English and Spanish. The margin of error for all cell phone owners (n=2,076) is plus or minus 2.4 percentage points. The margin of error for cell phone owners who go online using their phone (n=1,185) is plus or minus 3.3 percentage points.